Yoqneam, Israel, November 6, 2017 MIND C.T.I. LTD. – (NasdaqGM:MNDO), a leading provider of convergent end-to-end prepaid/postpaid billing and customer care product based solutions for service providers as well as unified communications analytics and call accounting solutions for enterprises, today announced results for its third quarter ended September 30, 2017. The following will summarize our major achievements in the third quarter of 2017, as well as our business. 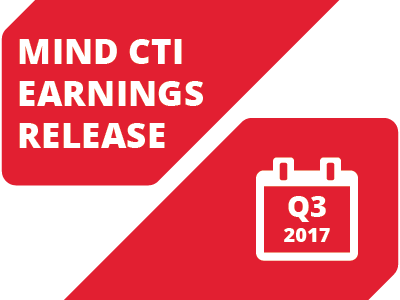 Full financial results can be found in the Company News section of our website at https://www.mindcti.com/company/news/ and in our Form 6-K. Revenues were $4.6 million, compared to $4.5 million in the third quarter of 2016 and $4.6 million in the second quarter of 2017. Operating income was $1.4 million, or 31% of total revenues, compared to $1.3 million, or 29% of total revenues in the third quarter of 2016 and $1.2 million, or 27% of total revenues in the second quarter of 2017. Net income was $1.2 million, or $0.06 per share, compared to $1.1 million, or $0.06 per share in the third quarter of 2016. Cash flow from operating activities was $1.7 million. Cash position was $16.9 million as of September 30, 2017. Revenues were $13.6 million, compared to $13.4 million in the first nine months of 2016. Operating income was $3.6 million, or 26% of total revenues, compared to $3.4 million, or 26% of total revenues in the first nine months of 2016. Cash flow from operating activities in the first nine months of 2017 was $2.0 million. As of September 30, 2017 we had 248 employees, compared with 267 as of September 30, 2016 and 248 as of June 30, 2017. Revenues in the Americas represented 76.3%, revenues in Europe represented 15.2% and revenues in the rest of the world represented 8.5% of our total revenues. Revenues from customer care and billing software totaled $3.8 million, or 82% of total revenues, while revenues from enterprise call accounting software totaled $0.8 million, or 18% of our total revenues. Revenues from licenses were $0.6 million, or 13% of total revenues, while revenues from maintenance and additional services were $4.0 million, or 87% of our total revenues. We always strive to maintain the highest support level possible and to have happy customers. With this in mind, we adopted the Agile methodology where we assign a dedicated team to customization tasks. This methodology enables us to better serve our customers and as always, our follow-on orders reconfirm their satisfaction. This quarter’s follow-on orders include an upgrade to our latest Version 8 (third customer to upgrade to our new version), agreements to support enhancements related to deployment of Voice over LTE (VoLTE), support for EMV (credit card payments, cards with chip), mobile payments, IMS integration for billing and provisioning as well as specific customizations and additional professional services. As previously mentioned, on a quarterly basis we incurred high fluctuation in taxes. Taxes include provisions for income taxes paid in our different locations at very different tax rates. Also, as previously mentioned, there is a change in the Israeli tax legislation, starting 2017. We have applied for a significantly lower income tax rate, based on incentive plans approved in 2017 under the Encouragement of Capital Investments Law. In case we obtain a tax pre-ruling that classifies us in Israel as a Preferred Technological Enterprise, we expect that our tax expenses will be significantly lower and that the influence on our results for the first nine months of 2017 might be up to $0.5 million less in taxes on income expense. The third quarter financial results do not reflect our expectations of a lower tax rate, as there is no certainty that we will obtain such a pre-ruling. As we previously announced, given our strong cash position and our experienced organization, we believe that we are well positioned and have the required resources to respond to market needs and at the same time focus on targeting potential acquisitions that could benefit the company’s growth. Our active pursuit is focused on acquisition targets at reasonable valuations that satisfy the criteria we defined: proven revenues, complementary technology, geography and expected accretion to earnings within two to three quarters. In the last two years, when evaluating acquisition targets, we faced increased competition from cash-rich corporations as well as the private equity industry, both sectors having high liquidity that they allocate to M&A activities. The excess of demand for deals has pushed valuations to highs, making it ever more challenging for us to find attractive deals.